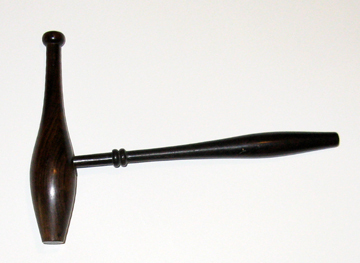 This gavel was found among undocumented IJA archives items. Future research and inquiry may identify the maker and donor of this unique IJA artifact. In a 1981 interview, Johnny Lux (John Loksa, 1931-1996), IJA president in 1962, recalled this ceremonial gavel being passed from each IJA president to the next. Dimensions: Club - 5.75" high x 1.25" diameter; handle - 7" long x .75" diameter. IJA Juggling.tv Copyright © 1996-2019 by the International Jugglers’ Association, Inc. All rights reserved.